I purchased an iPhone 5 recently and upgraded my cell phone plan to another 2-year contract. Now when you upgrade any phone on AT&T (and any other carrier), the carrier likes to tack on what they call an “upgrade fee.” The fee AT&T charges is $36. The upgrade fee is to allow us to assist customers with recommending new equipment, offering special offers and discounts, providing assistance with the upgrade process if needed, and supporting the returns process within 30 days. These specialized processes help us to ensure you are satisfied with your new equipment, and are ready to use it the day you receive it. The upgrade fee allows us to defray some of these additional service costs. To get this fee waived, simply call 611 on your phone, or click on AT&T Live Chat (billing and payment support) and kindly ask to have your upgrade fee waived. It may help by telling the customer service rep how happy you are with the service to butter them up a bit. ME: "I love AT&T and have been a customer for 4 years. I just noticed an upgrade fee of $36 on my most recent bill. I'd like to have that bill removed." REP: "I can see that you have been a loyal customer for several years. I thank you for choosing AT&T as your wireless carrier. As a one time courtesy, I have gone ahead and credited your account for the upgrade fee. You should see a credit on your account immediately." That's it. Every time I have any fees or extra charges, I always call the customer service rep and have them remove it. It costs companies much more to lose you as a customer than to waive a fee and keep you as a customer. If a rep doesn’t agree to waive the fee, kindly thank them and call back. The next rep will likely waive the fee. The customer service rep will tell you that this is a “one time courtesy.” Trust me, you can have this fee waived every time if you just ask. 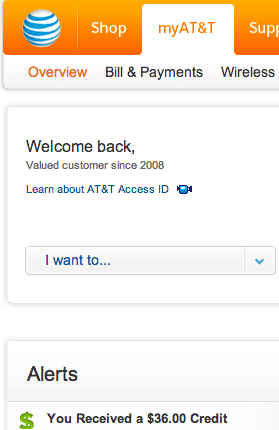 This trick applies not just in requesting an “upgrade fee” to be removed from your AT&T billing statement. This applies to other businesses such as credit card or utility companies. Simply call and they will remove any interest fees and late penalties if you ask nicely. If you’re too shy to call, feel free to use the live chat feature. I personally always like to speak with a representative and get it done over the phone. Go ahead and make that call. Within 5 minutes, you will save some money. Use that money to get an iPhone case or accessory, or save it for something else.